Denim. A fabric that nearly all of us can relate to or associate with. Something that gets better and somewhat becomes a part of you with age. The cliche nostalgia of throwing on a favorite pair of jeans or jacket you still have from college is often real! Impressions from Ralph Lauren, Levi Strauss, Wrangler or James Dean roll through your head making denim its own genre of style and as American as apple pie. Originally designed as a durable utility fabric for miners, railroad engineers and other laborers in the late 1800’s, denim needed to be strong, tough, breathable and affordable. It was completely a functional fabric. Something that can be worn day after day with little maintenance or worry. It wasn’t until the 1950’s when select Hollywood stars unexpectedly turned to denim for a rebel-istic fashion look. Some credit James Dean's role in "Rebel Without A Cause" as the single spark that changed everything. All of a sudden denim became stylish and evolved into a mainstream lifestyle juggernaut in the 1970’s, 80’, 90’s and 2000’s. To put simply, the use and popularity of denim had come a long way from its labor wear origins. Oddly enough, the actual fabric had not. Even today, denim can still come with the assumption of tough rugged fabric that needs some “wear and tear” before true comfort sets in. It's 2018 and we still need to break in some of our clothes? Hundreds of other fabrics allow for "slip on and go" or provide “move-with-you” capabilities. Spandex and lycra seemingly dominated the 80’s. Why such a delay integrating technology into mainstream denim? Let's face it, what's considered a utility today is much different than that for laborers in the 1800’s. Remarkably, the concept of “stretch denim” hasn't gained popularity until quite recently. Apparel companies all over the world are starting up based on new concepts such as performance denim, synthetic denim, technical denim and even water-resistant denim. In fact, the most hyped and sought after mills are now primarily located Japan - a country known for technology and high end textiles. And yummy sushi. The point is, the technology to modernize denim is available. Let's get to using it! 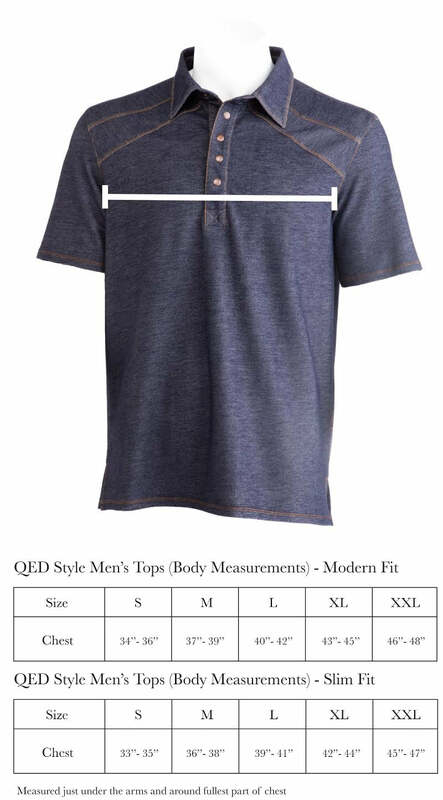 Since the very beginning, QED has tried to develop and offer apparel suited for both performance and style. We look to improve performance pieces (i.e. polyester shirts) by making them more stylish. Conversely, if an item or concept is known to be stylish (denim jacket), we ask how it can perform better in an active lifestyle. Nothing can be a better example of this than our ladies' Aurora jacket. Simply put, it's our version of the classic denim trucker-style jacket. We introduced the Aurora this fall marketing it as a denim jacket you can "swing in". The message was tied to a video of the jacket on a hanger swinging on a clothing rack (clever we know). We realize no one is looking at a denim jacket and thinking golf. But, we proudly offer a jacket that allows you to move without restriction and be able perform something as silly as swing a golf club with ease. Tell me what other denim jacket can do that? Pretty cool! A timeless style piece with performance abilities. The Aurora is what a denim jacket should be in 2018 - instantly comfortable, performance fabric blend with stretch, durable, non-shrinking and machine washable. All with a classic design and loaded with detailing. Thank you for reading! Want an Aurora jacket? Enjoy 15% off automatically applied at final checkout by clicking this link.